Despite a very nice collection of fine paintings, this Latin American Art auction fared very poorly with only 51 percent of the 71 offered lots selling, a dismal, disappointing and dreadful performance for an evening sale. Many of the best lots did not sell despite relatively reasonable estimates. Ana Sokoloff, the head of the Latin American Art Department at Christie's, said after the evening sale that it "did feel harder than other sales" and attributed part of the poor results to "obvious political" turmoil in some Central and South American countries. Nevertheless, the auction was well-attended by a well-attired crowd and its passivity is rather inexplicable given the fact that the recent slide in stock markets had been somewhat reversed in recent days, the high quality of many of the works, and the remarkably strong art market in general this season. The good news, according to Ms. Sokoloff, was that half of the lots that sold went to Americans, an indication that interest in the field is broadening. In addition, while the previous night's Latin American Art sale at Sotheby's (see The City Review article) was highlighted by the Frieda Kahlo self-portrait that sold for more than $5 million, setting a record for Latin American Art and for a woman artist, Sotheby's also encountered strong buyer resistance and only sold about 62 percent of its lots, also less than thrilling. This evening auction totalled $5,879,900, far below its pre-sale low estimate of $12,823,000. Despite general befuddlement about the overall results, Ms. Sokoloff was buoyed by the fact that auction records were still set for seven artists. Lot 71, "Reclining Venus," a bronze sculpture by Fernando Botero (b. 1932), sold for $468,000, including the buyer's premium as do all sales results in this article, breaking the former world auction record for his sculpture of $420,000 set at Sotheby's in November, 1989. Lot 53, "Nubes sobre la laguna," by Tomás Sanchez (b. 1948), sold for $314,000, breaking his previous auction record of $308,000 set at Christie's in May, 1998. The painting, a 77-by-95 1/2-inch oil on canvas, was the cover illustration of the catalogue, It had an estimate of $250,000 to $350,000. Lot 64, "Díptico - Interior con tinajas," by Guillermo Vera Muñoz (b. 1956), sold for $215,000, breaking his previous auction record of $60,500 set at Christie's in June, 1999. This price brought considerable applause from the otherwise rather subdued audience. 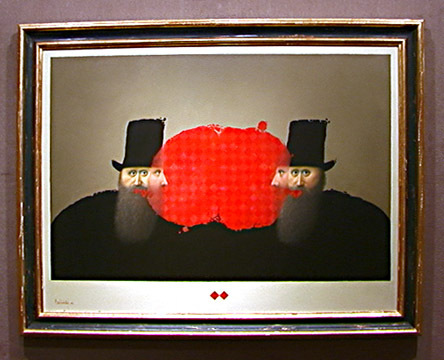 Lot 61, "Los diez manamientos," by Nicolas Leiva (b. 1959), sold for $30,550, breaking the previous record price of $27,600 set at Christie's in November, 1998. Lot 62, "The king and the shoemaker," by Walter Goldfarb (b. 1964), sold for $22,350, setting an auction record for the artist. Lot 63, "Tigre con garra," by Manuel Mendive (b. 1944), sold for $22,325, besting his previous auciton record of $18,400 set at Christie's in November, 199. Lot 1, "Banista," by Adolfo Riesta (1944-1989), sold for $21,150, breaking the artist's previous auction record of $741. The highest price realized at the auction was $721,000 for Lot 66, "En el viñedo," a 1920 oil by Diego Rivera, that had a low estimate of $1 million and sold to a Mexican private buyer. Other highlights of the sale included Lot 31, "La fogata de San Juan," that sold within its estimate for $468,000 to an anonymous buyer, Lot 56, "La novia," a 1910 work by Angel Záragga that sold for $292,000 and had a high estimate of only $220,000. The weakness of this market is rather baffling as demonstrated by the very large number of works that failed to sell at both Sotheby's and Christie's this season. It would appear that Latin American buyers are not as sophisticated as they should be and that the rest of the world still has not caught on to the fact that there are many marvelous and important Latin American artists who can hold their own internationally. For serious collectors, then, Latin American art, like Tribal Art, remains one of the few areas where good bargains still remain. For the past few seasons, Matta has stood out as the foremost "Latin American" artist available in the major auctions at both Christie’s and Sotheby’s, but this season he is bested by Rufino Tamayo (1889-1991). Matta, of course, is a great visionary Surrealist whose works transcend specific cultures or nationalities. Tamayo, on the other hand, is an artist whose aesthetic temperament is very much rooted in the earthiness and heat of tropic climes and in the rich cultural traditions of Pre-Columbian art of the Americas. Tamayo’s works stop short of being purely abstract - he usually depicts a human figure - but they are not far removed from the pulse of Mark Rothko’s best abstractions and indeed are usually hotter. His world is a supersaturated environment of color embedded, rather than floating over, his canvases, which are very richly textured. This auction has some very fine paintings by Tamayo, several of which are not done in his typical, intense, reddish palette and actually bear some similarity with Matta’s wondrous calligraphic style and brighter palette. Lot 16, "Tres personajes en blanco," shown above, a 37 ½-by-51 ¼-inch oil and sand on canvas painted by Tamayo in 1971 is a marvelous work depicting three white figures against a light blue background with yellow and violet highlights and red-brick grids. The painting conjures a light, cool variation of Pablo Picasso’s "Three Musicians," and is full of delightful details such as the intimation of a woman’s hair blowing in the wind with a few curved eye-lash-like lines from the middle of the head of the figure on the right and the apparent transparency of the middle figure’s torso and the almost mechanical structure of parts of the figures. It has a conservative estimate of $450,000 to $650,000. It was passed at $380,000! Lot 25, "Buscador de estrellas," shown above, a 18 1/8-by-21 5/8-inch oil and sand on canvas painted by Tamayo in 1960, has the intense, brilliance of lapis lazuli. "Throughout his lengthy career a process of reduction occurred, he gradually and consistently reduced those essential elements that are present in all his work to a series of tools, like a children’s set of toy blocks he used the same blocks in multiple variations to build his pieces. He simplified the literal content of the work to a point that explorations of color, texture, and form could be heightened. By the early 1960s, this reductive tendency had truly taken affect. Already visible in Buscador de estrellas, the human form, which had previously been distorted in fanciful and often frightening ways, begins to exude a totemic quality. The face has became standardized - an oval, two circles, a horizontal and a vertical line - a mask rather than a face. It is an important reference to Pre-Columbian culture, a source that Tamayo was quick to incorporate in a subtle manner. In writing about Tamayo, James Lynch has linked this conceptualization of the human face with the contemporary Mexican literature of Carlos Fuentes in which the bourgeoisie world of our time can no longer create myths and has become sterile, thus masks must be used in order to create fantasy identities," the catalogue entry for the lot noted. While accurate, this description oversimplifies Tamayo’s oeuvre, which is richly imaginative. While his subject matter may not vary much, his works are not formula-driven and demonstrate great individuality. This lot has an estimate of $250,000 to $350,000. It was passed at $180,000. Lot 19, "Carnavelesca," shown above, a 77-by-51 ¼-inch oil and sand on canvas painted by Tamayo in 1974, is a dazzling work that has a conservative estimate of $500,000 to $700,000. It was passed at $450,000! The record for a Tamayo is $2,585,000. A figure wearing a tall cone hat appears to be holding a large, slender white cross about which white streamers dance against a background that is vertically split between a light blue sky with a large moon and a pink structure with a light-green figure or object at the right behind the cross. The streamers convey the dynamic, festival atmosphere of a carnival but the strongly sculpted face of the main figure and the greenish color of the other figure or object lend a fine sense of mystery. Lot 13, "Spectral Bird," shown above, a 31 ½ -by-39 ½-inch oil on canvas, executed in 1956 is a relatively dark Tamayo and the catalogue notes that it "is reflective of his desire to minimize the amount of different colors in a specific piece and concentrate on the values of just a few." "It is a piece," it continued, "in which three or four colors are explored and subtly tinkered with. The painting is tectonic and graphic yet it is soft and its colors soulful, it is both abstract and concrete, strong and welcoming. Like many of his great works, this painting engages on many visual levels and the actual paint to elevated to a language of texture and color." It quoted the artist as having said that, "Pictorially speaking, it is more valuable to exhaust the possibilities of a single color than to use a limitless variety of pigments." The lot has an estimate of $400,000 to $500,000. It was passed at $320,000. Tamayo’s sculptures are powerfully tactile and totemic works. Lot 35, "Atlante," shown above, a bronze sculpture, 85 ½ inches high, with red, black and gray patina, was executed in 1990 and is one of 8 sculptures commissioned by GVG Editions of Monterey, Mexico issued in editions of three each with a unique and different patina. It has an estimate of $200,000 to $300,000. It was passed at $150,000. "Bravo has stated that the initial inspiration for his paintings of packages, wrapped canvases and draperies was the work of some of the New York School Abstract Expressionists, especially Mark Rothko. Although in none of his paintings does Bravo approximate the techniques or the secular spirituality of the Abstract Expressionist painters, there is, nonetheless, an analogous sense of calm and meditation in his images….While it [Emperor] is not a work directly related to the form of the packages, it is, nonetheless, an image in which the artist continues his intense investigation of the type of substances that propelled him to begin to do the packages in the early 1960s. Emperor plays a unique role in the development of Bravo’s visual language as an ultimate, logical conclusion of his studies of matter. This painting embodies the artist’s fascination with empirical investigation and his deep engagement with tactility. We may also look at Emperor in another light. During his long stay in Madrid, Bravo was an avid visitor to the Prado Museum. This repository of some of the greatest paintings by the most revered old masters was Bravo’s classroom. Among the artist that Bravo studied most closely were the Spanish Golden Age figures of Francisco de Zurbáran and Diego Velázquez. It was from Zurbáran that Bravo developed a deep reverence for the exact depiction of textiles. Zurbáran’s representations of monks wearing crisp, starched white habits, served as points of departure for Bravo. From Velásquez, Bravo came to comprehend the power of subtle, indirect illumination on cloth an other substances….emperor may also be understood as a key image in Bravo’s art of the 1970s as it looks forward to what he has done in the more recent past. After about 1990, Claudio Bravo began to pay more and more attention to studies of drapery. …Emperor is the largest of his drapery studies o the 1970s and it functions as a precedent for many of his most compelling paintings of the 1990s. In a recent public forum in Miami…, Bravo stated his belief that the paintings in the Prado Museum could virtually all be understood in terms of drapery. He urged his audience to look, for instance, at the accomplishments of titian, another artist who has provided Bravo with constant inspiration." The lot has an estimate of $600,000 to $800,000. It failed to sell and passed at $450,000. Lot 36, "Bolsas de papei," a 40-by-49 ¼-inch oil on canvas painted by Bravo in 1970, is a very good example of his paper bag series. It has an estimate of $180,000 to $220,000. It sold for $190,000. Bravo’s draughtmanship is remarkable and the large scale of his studies manifests his bravura, that takes "photo-realism" to a higher level: his objects become monumental and overwhelming, but the lushness of their color softens their visual impact. Bravo envelops his viewers and imposes a very clear focus on the specificity of an object, or related group of objects in a manner that is reverential but also virtually scientific. …Oh! The creases, the sags, the crinkles! While "humanity" may not be visible, one can look at the red and blue drapes and almost imagine that the red is playing "toesy" with the blue. Bravo’s showmanship is crystalline and sharp. David Alfaro Siqueiros (1896-1974) also is capable of smacking one in the face with great visual power. Siqueiros’s style, however, is much different. Bravo’s technique almost seeks to make the medium of paint invisible and only the object visible bathed in very clear and bright light. Siqueiros is a bold painter with broad brushes and his slapdash pictures ooze with energy and vitality. Lot 18, "Estudio para Caracol," a 27-by-20-inch pyroxilin on panel, shown above, is a study of a conch shell, much in the style of some still lifes by Marsden Hartley. Executed in 1940, this lot has a modest estimate of $60,000 to $80,000. It sold for only $58,750! "Although it was the large scale mural format that made Siqueiros one of the most important painters in Latin America, it is in many of his easel paintings that one can see the essence of his work. Removed from the overwhelming context of the mural, his technique becomes clearer and more approachable, his hand visible. Often the political and historical implications of his murals, the mere power of the context, overtake the details. These smaller works were usually done for private collections and though usually not outside of his typical themes - history, the Revolution, the proletariat; they convey something more direct about the art in technical terms than the murals - which are inescapable of their context and were painted by both the artist and assistants. Here we see Siqueiros’[s] love of the plastic nature of the pyroxilin paint. He uses the paint in thick heavy layers, catching and mixing colors, almost sculpting the surface of the canvas. In the forties, Siqueiros began to move away from the dark palette of his earlier works. Bright colors began to invade the somber tones and shadowy backgrounds without losing any sense of power. In fact, the works become stronger, the vibrancy more immediate and direct. Where earlier work is clouded in a weighty solemnity, often illustrating the sad state of the Mexican working class, these brighter works are reactive, confrontational statements not content to be commentary or cerebral. The change to powerful colors signals a much more direct recognition of the potency possible in the mural pieces. The colors become explosive, aggressive and hyper saturated, these are the colors of Revolution, not the sad introspective tones of his thirties work….Although not in motion, the image is almost pulsating in its urgent need to break out of the canvas, a still life full of motion. Weapon, horn, religion symbol, the caracol is articulated with architectonic points and crags, this is not a memento from the beach but a specific valuable object." About five years after he painted the conch shell, Siqueiros painted Lot 10, shown above, "El Revolucionario," a 31-by-25-inch pryoxylin on panel. This extremely powerful image of the face of a man wearing a large straw hat is Siqueiros at his best. The wide brim of the hat is marvelously painted in this tightly cropped image, its curves echoed in the top of the garment just below the face and again in the curve of the left side of the man’s neck. The nose is highlighted with an extremely bold triangular patch of white. The man’s lower lip projects determinedly from beneath the man’s mustache. His eyes are focused to the left. The man is clearly tensed for action. "In the early 1940’s Siqueiros was once again out of favor with the Mexican government. For almost three years, he was in a state of exile, not welcome in Mexico due to his involvement on the attack of Leon Trotsky. Feared by many Latin American governments as a social agitator he spent this period seeking work and asylum. This period best reflects the real power of Siqueiros as a leader, while he was greeted with unease and suspicion by many, his power was recognized and supported in unusual ways. Although he was denied a visa to enter the United States, as he was a known communist, he received a grant from the United States State Department for an important lecture tour he wanted to conduct ‘Art for Victory’. Already a committed opponent of the Fascist movements plaguing Europe, and further disgusted by Nazi support he saw in South America, Siqueiros launched a program to raise awareness and support for the anti-Fascist forces through art. Again he used his art as a platform for change and social response, his lectures initiated programs throughout the region. After completing projects in Chile and Cuba, Siqueiros was allowed to secretly return to Mexico in 1943. As he was not free to be in public, he immediately began working on an important mural in the house in which he was living in hopes that its unveiling would rekindle the scattered and weakened Muralist movement. The revealing of the mural Cuauhtemac contra el mito was planned to acknowledge Siqueiros return to Mexico. The government did not intervene when flyers announcing the unveiling were sent and interest in the project increased, signaling their tacit acceptance of his move back into public life. The unveiling was a great success and immediately afterwards Siqueiros began issuing manifestos and looking for a public mural project. A public project would not come through until 1945. Throughout his career, Siqueiros frequently used his easel works as a way to live between commissioned projects. Though these works were most often created for private collections and destined for collectors’ walls, they were not free from his political ideologies and aims. The smaller format allowed him in many cases to work on themes and details to be incorporated in his murals. A hallmark of Siqueiros’ identifiable style is a cinematic or photographic like closeup, in many of these works he would often crop the borders of the piece like a photographer, zeroing in on the object and detail. El Revolucionario is such a work. At first glance it is a straightforward portrait of a revolutionary,. Upon further observation more information is revealed. Encoded in the strong brushstrokes that form the stern face of the revolutionary is the symbol of the Communist Party; a hammer emerges from the profile encompassing the nose, and the sickle from a swooping movement on the right of the eye. Though often at odds, Siqueiros was a prominent member of the Communist Party of Mexico throughout his life, it follows that he would use even a portrait to send a political message. His paintings, like his murals, are powerful affairs not content to be without strength." The work has an estimate of $90,000 to $110,000. It sold for $116,000. The record for the artist is only $209,000. Another fine Siqueiros work is Lot 41, "Provecto parael mural Del porfirismo a la Revolucion en el Castillo de Chapultepec," shown above, a 48 1/4-by-66 1/4-inch pyroxilin on masonite, oil on canvas study for his mural at the El Castillo de Chapultepec. In 1957, the artist was commissioned to execute a mural depicting the Revolution for the El Castillo de Chapultepec that was being converted in to the Museo Nacional de Historia. This study for the mural was painted in 1958 and depicts one of its main focal points, the 1906 miners' strike of Cananea, which is regarded by many as the birth of the Revolution. The mural took ten years to complete in part because of the second incarceration of the artist in 1960 that led to his spending four years in jail for political crimes. It has an estimate of $150,000 to $200,000. It sold for $193,000. Lot 8, "Recojedor de agave," by Diego Rivera (1886-1957), watercolor, 16 1/4 by 13 inches, 1941, shown above is a superb and simple work that has an estimate of $30,000 to $40,000. It was withdrawn. The auction has a wonderful pendant for it, Lot 9, "Road Workers," a gouache on paper, 10 7/8 by 8 1/8 inches, executed in 1932 by Rufino Tamayo. It has an estimate of $20,000 to $25,000. It sold for $35,250. Leonora Carrington (b. 1917) is one of the more exotic Surrealists and is represented by several good works in the auction. Lot 29, "Ulu's pants," oil and tempera on panel, 21 3/9 by 36 inches, shown above, was executed in 1952. It has an estimate of $100,000 to $150,000. It sold for $138,000. The record for the artist is $473,000. Lot 213, "Casting the Runes," by Leonora Carrington is a mixed oil, tempera and gold leaf on three-ply, 30 3/8 by 17 3/8 inches. Painted in 1951, it has an estimate of $70,000 to $90,000. Another Carrington work is Lot 14, "Courage and the Art They Did Not Lack," an oil on canvas, 15 by 18 1/8 inches. It was painted in 1959 and has an estimate of $100,000 to $150,000. It sold for $90,000. The painting refers to the work of George Ripley, an English alchemist of the 15th Century. Another Carrington, Lot 65, "Baile de másaras," a bright, fine 1954 work, sold for $292,000 and had a low estimate of $350,000. It was part of a small group of paintings from a private collector, Gary Nader, an art dealer in Miami, Fla, that was in a separate catalogue for this auction. A fine mystical work is Lot 34, "Creacion con rayos astrales," by Remedios Varo (1900-1963), shown above, an oil and tempera on masonite, 26 by 16 1/2 inches, that was executed in 1955. The work as an estimate of $280,000 to $360,000. It was passed at $240,000! The auction record for the artist is $825,000. Another interesting painting is Lot 2, "El Secreto Compartido," by Alfredo Castañeda (b. 1938), shown above, a 31 1/2-by-43 1/4-inch oil on canvas that is being sold to benefit the Museo Nacional de Arte Munal in Mexico City. It was executed in 1999 and has an estimate of $50,000 to $70,000. It was bought in at $38,000. One of the auction's loveliest works is Lot 33, "Nuncio Solar," shown above, by Alejandro Xul Solar," (1887-1963), pencil and watercolor on paper, 8 1/4 by 4 1/4 inches, 1923. The lot has an estimate of $70,000 to $90,000. It passed at $55,000! Another highlight of the auction is Lot 39, "Codice de Juchitián," by Francisco Toledo (b. 1940), one of the finest contemporary Latin American artists. This 30 1/4-by-22 1/4-inch plaster and chalk on canvas is a stunning, swirling vortex of whites and grays and was painted in 1973. It has an estimate of $60,000 to $80,000. It was passed at $45,000. Carlos Mérida (1891-1984) is a very good and consistent artist who focused on geometric abstractions that use many Pre-Columbia stylistic patterns. Lot 232, "Figuras abstractas," a 29 1/8-by-22 1/2-inch watercolor and ink on paper, is done most in cool blues rather than his usual hot reds and was executed in 1978 and has an estimate of $18,000 to $22,000.